Garden Amendment, Coconut Coir: What is it good for? One of just a few garden amendments I like to use is Coconut Coir or fiber. It is the fiber from between the hard shell of the coconut and the hard outer husk. I have buckets of this when I am done opening coconuts, but the Coir I am talking about today comes to me shredded and compressed into a small block. I throw the block of Coconut Coir into my wheel barrow with 6 gallons of water and it breaks apart and becomes a wheelbarrow full of fluffy peat like soil amendment. You can use this Coconut Coir as a replacement for Peat Moss which comes out of millions of years old bogs that are being destroyed to bring us peat moss for our gardens. I like it very well for amending my sandy soil when I am putting in a new perennial plant or tree, just one or two shovels full mixed with the soil in the planting hole for a 3 gallon potted plant works great. 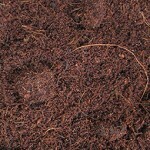 Coconut Coir is also a great component for creating a potting mix. Try it with an equal part of compost and a bit of sand for a decent potting mix. Coconut Coir comes with the Can O Worms worm bin when you buy one, and when you harvest that first or bottom tray, the one that had the Coir in it, those are the fluffiest most easily used worm castings you can get. I am now using Coconut Coir in all of the trays of my Working Worms worm bins. 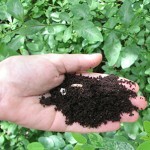 The worms love it, and I think it vastly improves my worm castings product. Now that you know what it’s good for why not try some Coconut Coir? You have been so prolific in writing, as of late, that I cannot keep up! Sources for coconut coir at a good price? I need a few bricks for my worm friends to split and multiply in another bin and would also like to know of a source for larger quantity as a soil builder. Thanks and keep the posts coming. Hi Christine, Thanks for your comment. I’ve been taking breaks inside afternoons it’s been so hot. So I write.